Learn to make this flag. It’s easy! I have a bunch of photos and all the details here. Thank you painters tape. 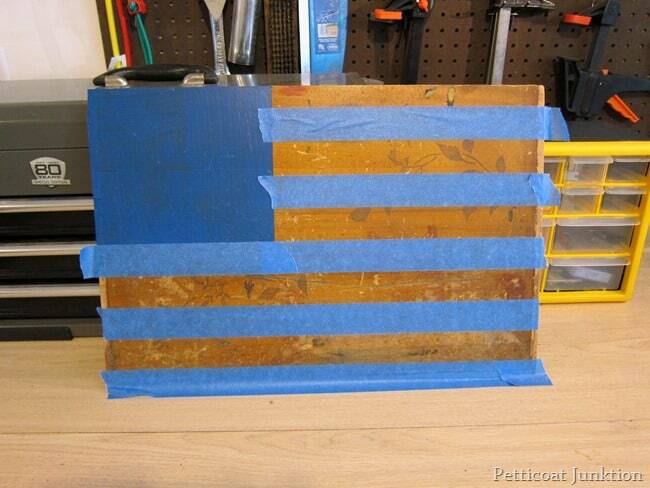 I made the stripes on my rustic American Flag the same width of the painters tape. No measuring. woohoo! I painted the flag and hung it above my favorite red, white, and blue chest in what we call the grandsons room. 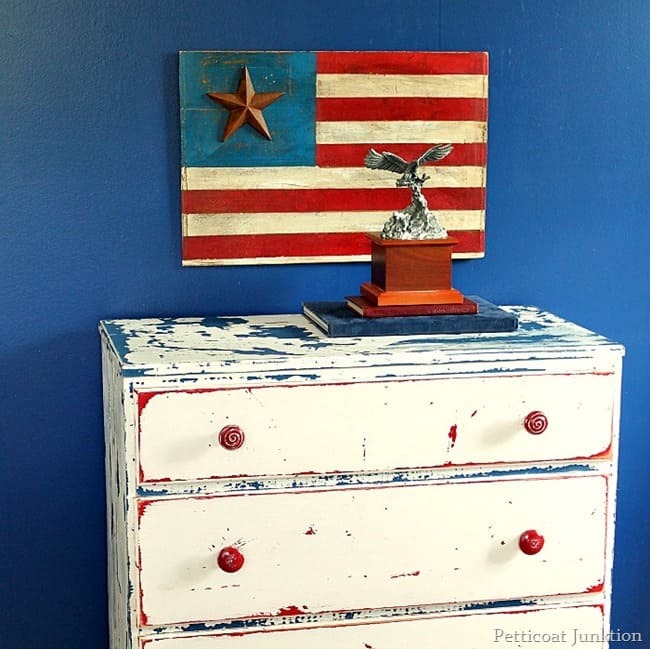 The flag is painted on a reclaimed drawer bottom. You can see I practiced a little stenciling on the wood at some point a long time ago. The rustic star has been around for awhile. I ordered a bunch of these on EBay a few years ago. As I said, no measuring. I guesstimated the size of the blue block and taped it off. The blue paint is an awesome color. It was a $1 purchase at Lowes. It’s Valspar but I don’t know the color name. If you’re interested I can run out to the workshop and look on the jar. Just let me know. I love oops paint!! I was trying to decide what size to make the stripes and how to measure them whenever I had an ah-hah moment. The tape was 1½” wide so I just made the stripes that width! The red paint is an acrylic. 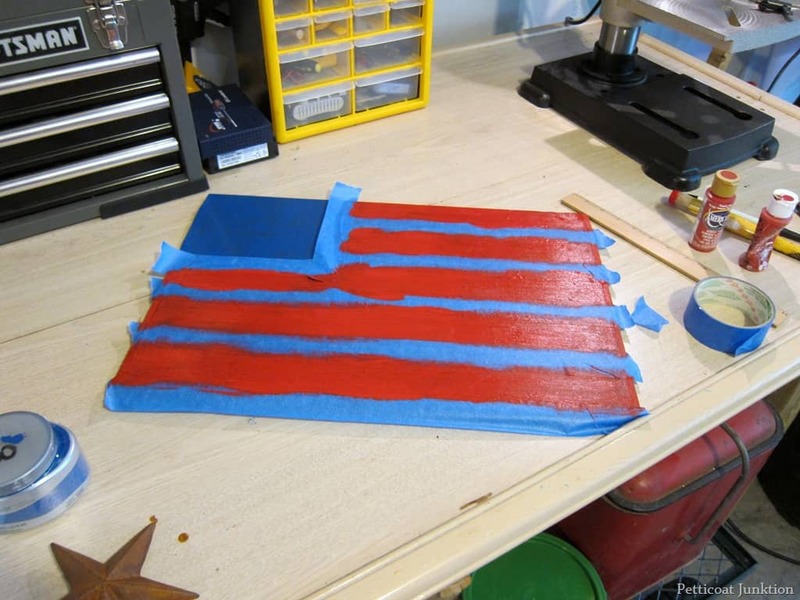 To paint the white stripes I just covered the red stripes with the blue painters tape…same width remember…and used white acrylic paint. 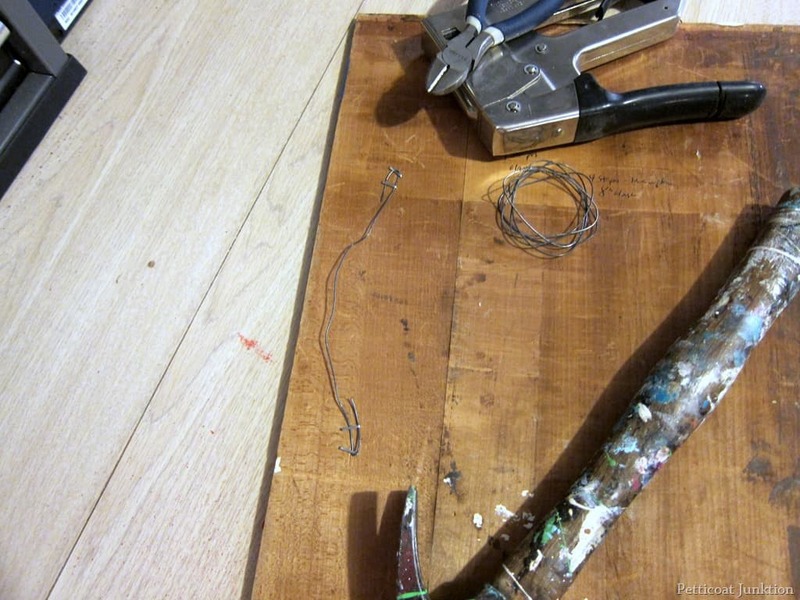 The hanger is a piece of wire just stapled on. The wood for the flag is really light so a lightweight hanger works perfectly. The iron star is one with a nail head. We had to cut the nail down because it was too long for the thickness of the board and I drilled a starter hole before nailing it in. Don’t want the wood to split. 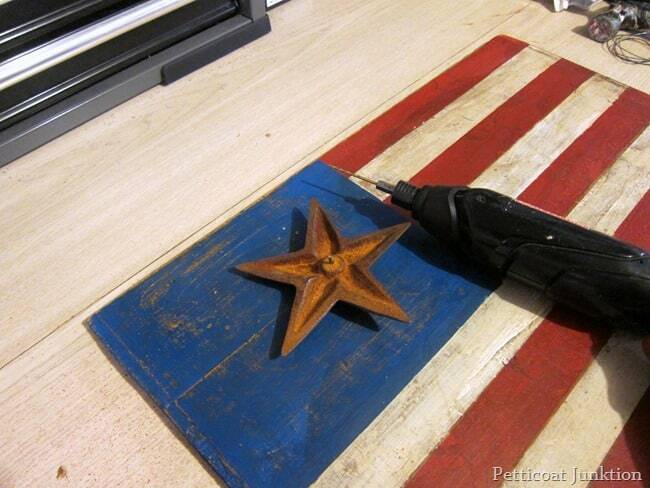 For the finishing touches I distressed the flag and used a dark wax. 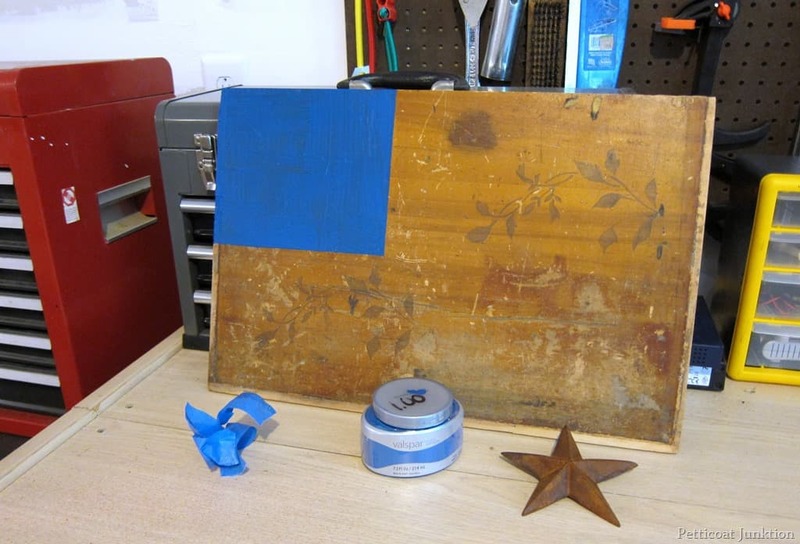 Watch the video of me putting together a Farmhouse Style Flag here….. It looks great hanging over the chest but I think I’ll move it to the mantel in July. Just for the month. I made a farmhouse style neutral flag too. You might be interested in the details. 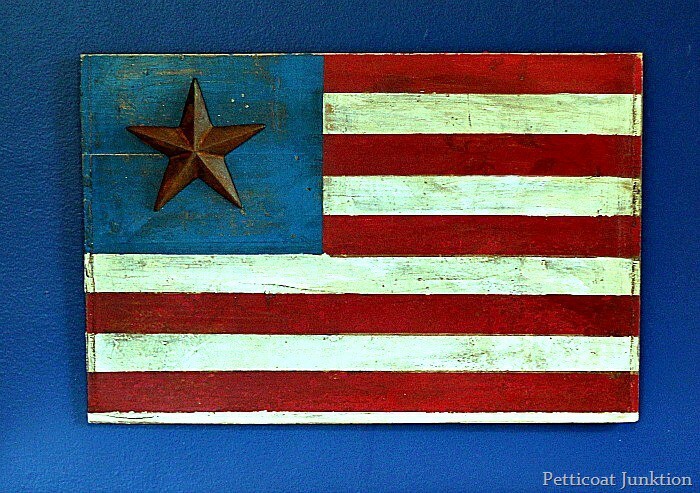 Just click here….Farmhouse Style Flag. Love it!!!! Could you please tell me how to distress the wood? Hi Dawn, I just used a sanding block on the coarsest side and distressed until I got the look I wanted! Oh I love this flag Kathy! The star is so cool and I love that you distressed it! Perfect! This is so adorable, I love the rustic star on it. Love how easy it was to make too, awesome job!! Love your flag, it looks great with one star on blue field. Glad to hear your flag isn’t too heavy to hang on wall or any place it suits you. I used to have lots of those stars, got them in MT and KY.
Had to get rid of so many awesome things before we moved from KY to move to western CO where we live now, about 18 miles west of Grand Junction. Your flag is a great size, not too big. Think I made mine too big, used an end off a pallet, added boards between existing boards. Took me while to get all the stripes right and the stars. Looked at a little flag I had for placement of the stars. Fun project tho. 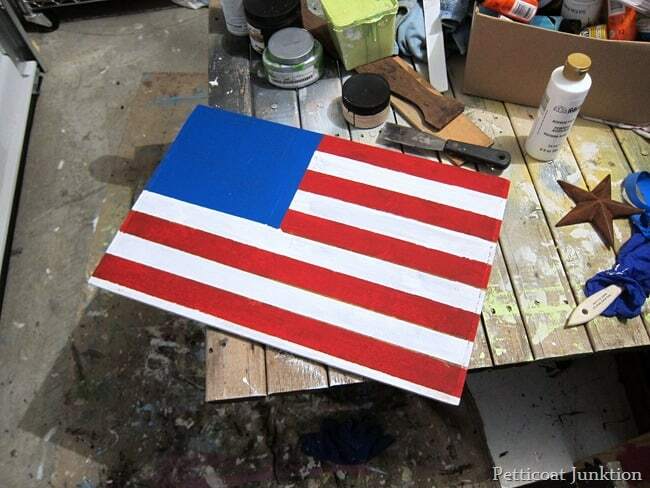 Will have it ready for July 4th. along with printing out several of free printables offered. Love to decorate front porch for holidays. Love love love your creativity, Kathy. VERY impressive! Happy July 4th. You pulled this together with such ease,like you’ve been making these for years! I love the rustic feel you gave the whole piece. Using the metal star instead of white stars makes it really unique. Love it!! Thank you Amy, I love the rusty star! 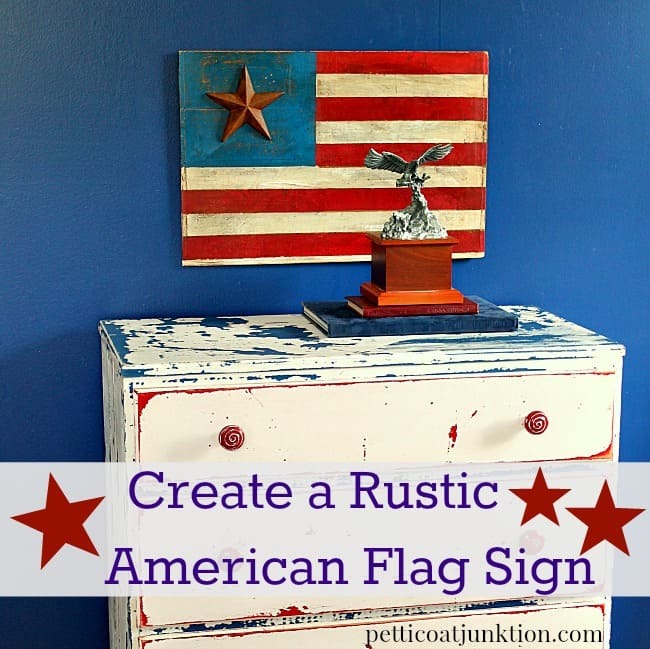 I absolutely adore the rustic charm of your flag! I’m in love with the iron star. Every time I think about tackling a project like this I always shy away because I don’t have the patience or skill to hand-paint so many little stars! 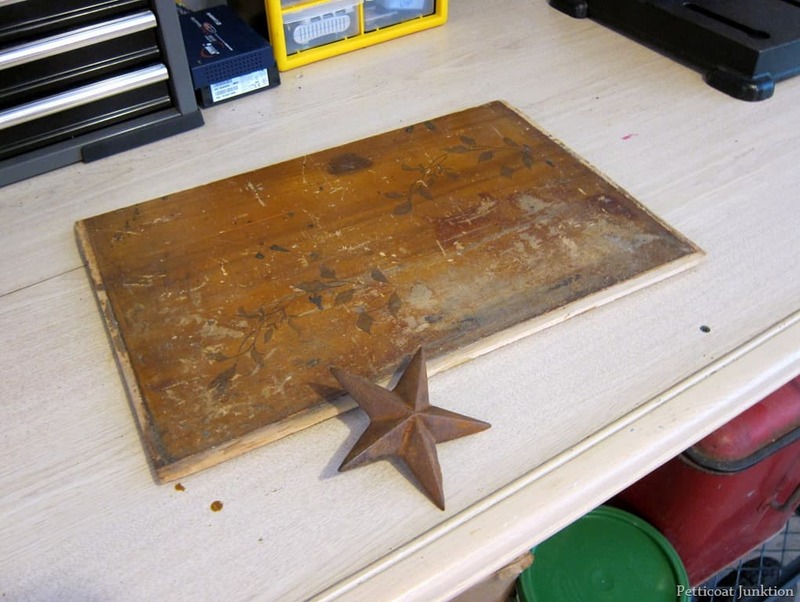 Jazmin, I don’t have the skills to paint freehand so that’s why I use stencils…..or stars! Glad you like it. Really a great project and tutorial….THANKS! Thanks Nancy, You know how sometimes in the middle of the night when you can’t sleep because your brain is going 90 miles an hour?….idea time..
That’s one of my favorite chest of drawers and it shows up in a lot of my photo displays! Kathy you have the coolest stuff in your stash! That iron star is the perfect touch. And using an old drawer bottom? Genius! I love your project. Thanks for joining the tour! Thank you for sharing your tips and experiences. I have learned a great deal and now have a new hobby. A question: I want to redo a real antique dresser that is already quite distressed just from age. It is oak with varnish/urethane peeling off. It seems sorta sacrilegious to paint it. What would you do? Wow, not sure Linda without seeing it. You may want to just wipe off all the peeling stuff and give it a good cleaning then use hemp oil to restore the finish that’s there. ok; if you’d like, I can send you before and after pics? I love this, Kathy! You were smart to use the tape size and not have to worry about measuring. When that works out, it’s a good thing. I think I’d leave this hanging above your dresser all of the time. They look great together! I will probably leave it there for a while but it may get a place of honor on the mantel for the 4th. So darn cute, I love the rusty star it makes it just perfect. Rust is always good. Thanks for the nice comment!